Ever wonder what a Caliber SRT-4 would look like with 24 inch wheels? 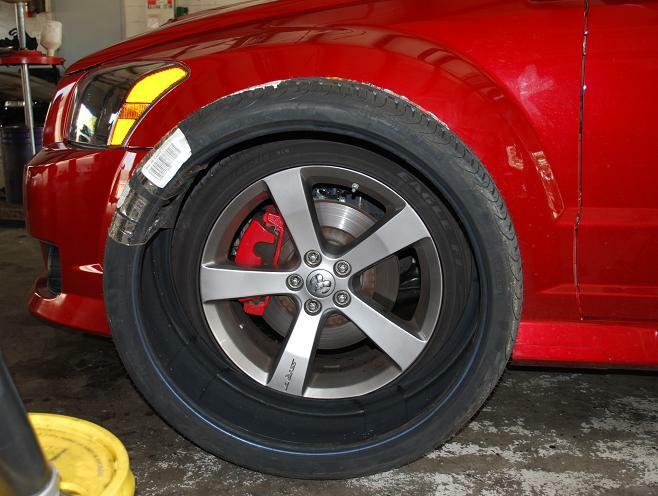 Yesterday we were testing some parts on the Caliber SRT-4 when we noticed a 24 inch tire nearby. For grins, we rolled the 24 inch tire over to the Caliber and put the tire in front of our factory wheel/tire. Notice, we could fit the ENTIRE factory wheel, and tire INSIDE the 24 inch tire. Hehe. Plus, we’d have to do some cutting of the sheetmetal to fit tires this large too. 2008-2009 Dodge Caliber SRT4 owners who change their own oil, take notice! Tried fitting a new set of wheels onto the Caliber SRT4 today and they didnt fit. New wheels for the Caliber SRT4 project car ..